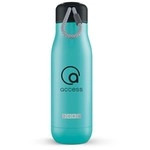 2-in-1 BPA Free Custom Water Bottle w/ Bluetooth Speaker - 25 oz. Stay hydrated and listen to music on-the-go with this 2-in-1 BPA Free Custom Water Bottle w/ Bluetooth Speaker! Simply connect the speaker to any bluetooth enabled device to enjoy music, audiobooks, and more.